Attention: you there who want to get abs! Do you want to get awesome-looking visible abs in 1 week? Do you also want that without much effort? Well, then pay very close attention now. Because if that is the level of commitment and effort you are willing to put in, then you will never have visible abs. No time-frame can be put on how fast you can get abs since it depends on your current situation. More specifically it depends on two factors that I will elaborate on below. By the way, it will probably take much longer than 1 week. Getting visible abs like having a 6-pack comes down to two factors. These two factors are 1) body fat percentage and 2) development of the abdominal muscles. 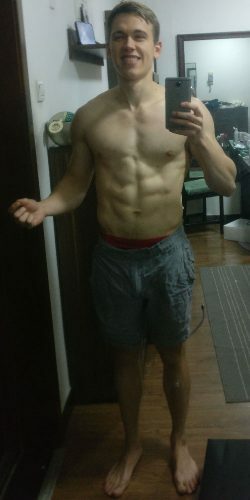 On the one hand, you can have pretty weak abs/core and still have visible abs if your body fat percentage is low enough. On the other hand, you can have a super strong abs/core and have no visible abs if you have a lot of body fat covering it up. In general, you can say that developed abs can be visible at a higher body fat percentage and with less developed abs you need a lower body fat percentage for it to show. However, if you want impressive looking abs you need both. The body fat percentage normally required for having visible abs are different for men and women because of genetic differences. Women carry more fat than men, but it distributed differently on the body. I would say that most men can have somewhat decent abs around 10-12 % body fat if they have trained them. But for impressive-looking abs, it has to be even lower around 8-10 %. For women, I feel it varies more and that the range is bigger. Women can have decent abs with body fat around 18-22 %. But again for more impressive-looking abs, you need even lower. Make no mistake, for both men and women, these are low levels of body fat and the majority of people never achieve that because it is not easy. I am around 9-10 % body fat in this photo. Most people will have to get rid of a lot of belly fat before they have those visible abs. If that applies to you I highly recommend doing heavy weight training paired with a moderate calorie deficit. I have a few resources you can check out for more information on this. Or you could just get my complete guide and email course on building muscle and burning fat. You get both automatically when you join my email list. Obviously, I am talking about getting abs, but you have to train your whole “core” and not only your abs. Your core is made up of the abdominal muscles, the obliques, and the lower back. Training the whole core will prevent injuries and ensure a good posture. But it will also make your abs look more impressive! There are a lot of different exercises you can do. But if you are like me you are not interested in “41 awesome abs exercises” like you see on some of those huge viral sites. You want a few very effective exercises. The easy way to do it is just adding lying or hanging leg raises to your workouts. You could cycle them, so for 1-2 months you do lying and then 1-2 months of hanging. Always finish your legs raises with a hip bridge. What has been working for me and it seems like a lot of other people is doing leg raises 3-5 sets for 15-20 reps. When performing those starts to get “easier” (not the same as easy) you can focus on making it more difficult by speeding it up as you are reversing the movement. You can also add a bit of weight. You can either put on some ankle weights or squeeze a small dumbbell between your legs. If you are interested in a thorough and free abs guide, then you should check out this awesome one by Rusty Moore from Visual Impact Fitness. It is what I used myself when I first started out training my abs. If you want a very comprehensive abs program with what I would call a fool-proof progression plan, then I can recommend the premium program Specforce Abs. There is an important lesson that many people learn when they finally get the clean cut abs they always dreamed of. If you never had visible abs before it is easy to get a bit obsessed with it. This often leads to creating high expectations of what it will be like when you finally have those cool visible abs. I would even go so far as to say that for some, it can become a ”romanticized idea”. They become so invested in the idea that their expectations become crazy, they think they will be happier and much more confident. Of course, it is pretty cool to have abs but beware of having high expectations. My point with saying this is that don’t get too emotionally invested in getting abs. By the way, this is something I believe is true for achieving any kind of physique goal. I’ve heard a saying: “You build abs in your kitchen”. There’s some truth in it, given the importance of a balanced diet for losing (belly) fat. Of course, building a strong core is a must!